Murudeshwar Temple or Murudeshwara Shiva Temple is famous Lord Shiva temple, located in the beach town of Murudeshwar, 16 km from Bhatkal in Uttara Kannada District, Karnataka. 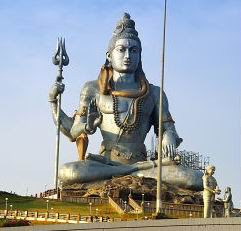 Murudeswara or Murudeshwar means Lord Shiva or Eeshwara and the statue of Lord Shiva here is the one among the World's tallest Shiva Statues, measuring 123 feet (37 m) in height. The statue of Lord Siva is constructed so that it directly gets sun light and thus appears sparkling. Located on the coast of the Arabian Sea, the town of Murudeshwara is also a beautiful picnic spot bounded by the hills of Western Ghats and situated between Honnavara and Bhatkal. The Beach Temple of Murudeshwara towers on a small hill called Kanduka Giri, surrounded by the Arabian Sea on three sides. One can see two life-size elephants at the temple steps. On going up the hillock, there is a shrine of Jattiga seated on a horse. 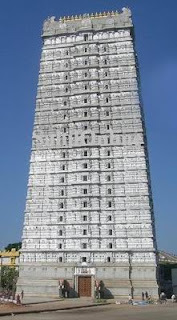 The 20-storied, 249 feet tall Raja Gopura is considered the tallest gopura in the world. A huge fort called Murudeshwara Fort, present behind the temple, is said to have been renovated by King Tippu Sultan of Mysore. Murudeshwar Temple has many carvings and statues that date back to a few centuries. Few inscriptions are also found in the temple. The Chalukya and Kadamba sculptures found in the temple are designed in the Dravidian style. A Nataraja statue made of bell metal is also seen outside the Murudeshwar Beach Temple. Maha Shivaratri is the major festival celebrated at Murudeshwar Temple in a grand scale, attracting thousands of people from Karnataka and the near by states. The Beach Temple of Murudeshwar is about 165 km from Mangalore on the National Highway. Murudeshwara is 1 km detour from the National Highway NH-17 between the towns of Honnavar and Bhatkal. Murudeshwara or Murudeshwar is 500 km from Bangalore on the Hassan - Mangalore - Udupi - Kundapur route and 470 km from Bangalore on the Shimoga - Kollur route. Bhatkal is about 16 km from Murudeshwar. Murudeshwar Railway Station or Murudeshwara Railway Station on the Konkan Railway is the nearest railhead. Netravati Express, Matsyagandha Express, and Gandhidham Nagercoil Express passes through Murudeshwar Railway Station. From Bangalore there are no direct trains to Murudeshwar. Bhatkal Railway Station (21 km) and Honnavar Railway Station (36 km) are other two major railway stations close to Murudeshwar. Mangalore International Airport is the nearest airport around 165 km from Murudeshwar. Hubli Airport and Goa Airport (220 km) (19 miles from Panaji) are other alternative airports. Sri Idagunji Vinayaka Devaru Temple at Idagunji (20 km), Kollur Mookambika Temple (65 km), Gokarna - a renowned Shaivite pilgrim center (70 km), Jog Falls or Gersoppa Falls - one of the highest waterfalls in India (90 km), Udupi - a Vaishnavite coastal town famous for the Krishna Mutt or Udupi Krishna Temple (100 km), and the an ancient temple town of Banavasi (145 km) are some of the nearby places of tourist interest.